Third year of the three-year cycle. An updated program offering instruction in the contemporary context on the main aspects of canon law and certain aspects of civil law affecting consecrated life. It is intended for present and future leadership teams and lay persons working in the administration of institutes of consecrated life or societies of apostolic life. The program will also be offered online. Fees: $600 (Session, hand-outs, receptions) includes $50 non-refundable deposit. Change in management of residence bookings this year! A block of rooms has been reserved for those attending the 2019 Legal Education Program. A cost of $120 per suite. In order to reserve a room, please communicate with Sister Louise Charbonneau, SCO, at lcharbonneau@ustpaul.ca BY MARCH 4th. A meal plan is available for lunches. 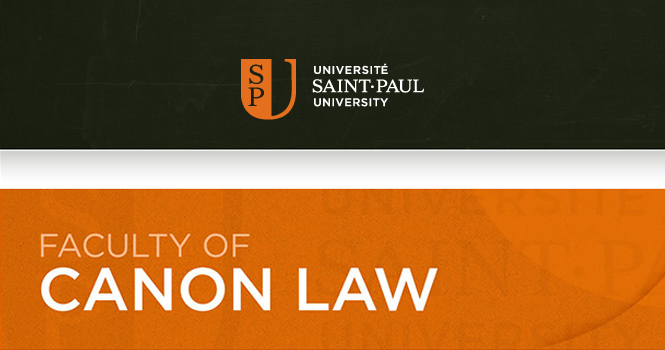 More details available at ustpaul.ca/legaleducation.